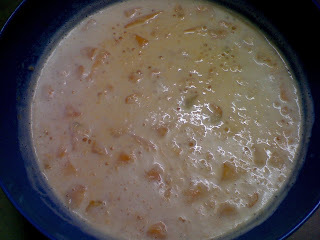 Next, add in 1/2 cup of full cream milk to the puree. Then, dilute 2 tbsp granulated sugar with 1/2 cup boiling water. 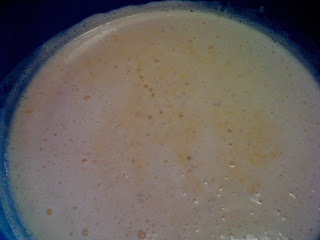 Pour that in the puree and add in 350g of vanilla ice cream. Stir until all the ice cream melt. Bring a large pot of water to boil and soak 100g of sago for 10mins. Drain the water and pour all the sago in the boiling water and cook until turned transparent. Turn off the heat, and cover the pot and let it stand for 10mins. Then, run all the sago through cold tap water (Melbourne's got really clean water) and pour all the sago into the mixture. You might wanna chill the mixture in the fridge while dealing with the sago. Cubed in the other half rock melon + 1 whole rock melon into the mixture. Chill well before serving. I don't think you can keep this overnight because I have some complains about it turning bitter the day after. It could be due to the milk content or it could be due to me puree-ing a lil' of the skin of the rock melon as well, I really dunno. I don't have any problem about keeping it overnight because this disappears pretty quick! 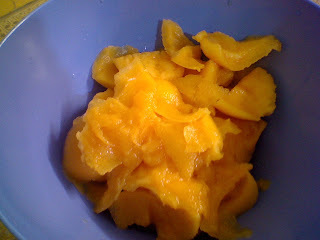 p/s: If you need to serve more or find the dessert too thick or creamy to your liking, cut down on the ice cream to your liking and feel free to add sugar syrup (2 cups of hot water + 1/2 cup castor sugar). 3 comments on "Rock Melon Sago Dessert"
You cook and bake better than me, what's this compared to all your collections and creativity?